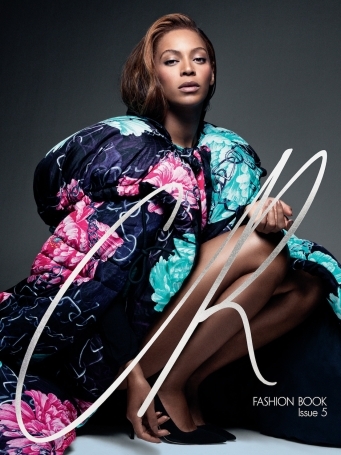 The beautiful singer Beyonce is on the cover of the fifth issue of the Carine Roitfeld Fashion Magazine. She wears a gorgeous Yohji Yamamoto cape in huge floral prints and a pair of black heels (the photo above). The look is flawless empowered with an interesting expression of her eyes. The shoot for the PR Fashion Book is a collaborative work of photographer Pierre Debusschere and creative director Riccardo Tisci. They created a wonderful lookbook featured with designer items of Saint Laurent, Givenchy, Prada and Comme Des Garcons. In addition, the fifth issue of the magazine displays the poem written originally by Beyonce! Check out all the photos of the shoot (and the poem), where you will find Beyonce posing with Chanel's surfboards.